When the sun is soon to appear above the horizon, the morning star, shining with a light derived indeed from Him, but nevertheless shining bright and clear even before His coming, gives the signal of His approach. 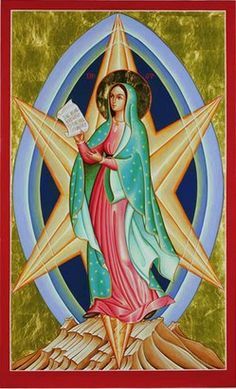 So, the Holy Mother of God, dawning upon the world with a grace and beauty which was the gift of her Divine Son, anticipated His Incarnation and made the world more beautiful in God’s sight than it had ever been before. Mary was more precious to God than all the rest of men, and this quite independently of her Divine Maternity. Consider why this was, and learn a lesson for yourself. The morning star is still clearly seen when all other stars have been extinguished by the light of the coming day. Mary has a brilliancy so great that the brightness of all the other saints fades into nothing in comparison with hers. If this was the case even in comparison with the glory of Saint John Baptist, Saint Joseph, Abraham the Patriarch, the friend of God, Job, the model of patience, Daniel, the beloved of God, what must her glory be! Thank God for having created one child of Adam worthy of Himself. Mary’s consummate beauty is the consequence of there being in her nothing of her own. All was God’s; no admixture of self in her motives, in her aims, in her joys and sorrows, her love and hatred. Her affections were simply a reflection of what God loved and hated; like God, she loved all things except sin, and those who were the declared and eternal enemies of God. She desired nothing for herself except that she might see God’s holy will fulfilled in all. Is this the account that you can give of yourself? Only if this is so are you a worthy child of Mary.